Toronto, ON – June 6, 2012 – ITC Systems, a leader in technology innovation, showcases commitment, partnership and innovation between the esteem staff at San Francisco Public Library and Konica Minolta. The libraries required self-service print release stations, print card readers and cash card loaders with credit card applications throughout all of San Francisco. SFPL was in search of an intuitive solution which required minimal training for its staff and patrons. Several months were spent mapping out an implementation plan between the teams to incorporate a PrinterOn Web-Based Printing solution allowing patrons to send jobs directly to their chosen Bizhub from home or through SFPL’s wireless network. San Francisco Public Library’s choice of the ITC Systems solution means users can now view hot spots directly from the library home page. Two different solutions went into effect throughout the library district. The main library and two of the busier branches, ITC Offline popup were installed at the workstations. Users submit print jobs to the Print Manager Release stations by entering a username and password at the public workstation. In other locations, Secure Print is turned on in the Konica Minolta driver at the workstations. Jobs get submitted directly to the multi-function device from the public workstations. Clients use the panel on the Bizhub to release their print jobs directly. A majority of the branches have adopted this setup flawlessly. Devices are set-up providing information of each processed job, but also tracks a user’s balance and attributes of that job. This functionality is unique and is supported only by ITC Systems. Data cap modems were also installed in each unit to enable credit card capabilities through the libraries relationship with Bank of America. Users can simply swipe their credit card and the interface does the rest. The transaction is seamless to the user and upon batches settling through the merchant, the funds are directly deposited into a designated library account. Mr. Richardson says he is very satisfied of the overall project, consisting of 36 Cash Card Loaders, 42 Card Readers, 16 Microfilm Readers, ITC Print Manager software supporting 300 high use workstations and ITC Wireless Solution by PrinterOn serving 112 printers among 28 branches. 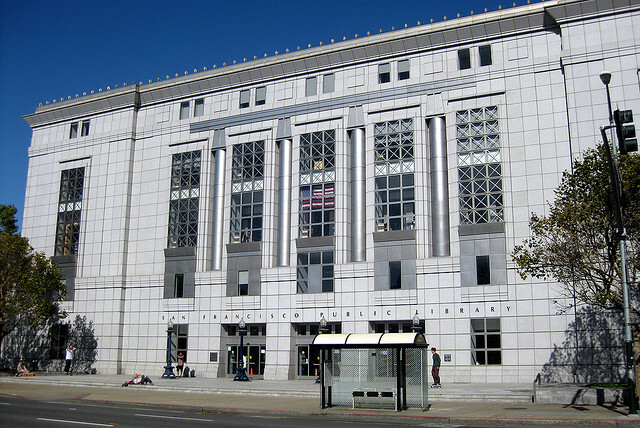 San Francisco Public Library’s choice of the ITC Systems print solution has complied with the “green” effort mandated by the City of San Francisco. Mr. Richardson says the ITC Systems’ team, SFPL and Konica Minolta project team is looking forward to working together in years to come. “Print solutions are important for everyone as it lowers rising network printing costs. ITC Systems appreciates the opportunity given by SFPL to make a difference.” he says. The San Francisco Public Library District with 28 public branches is nestled in beautiful Northern California overlooking the Golden Gate Bridge. The first public library of San Francisco officially opened in 1879, just 30 years after the California Gold Rush. The new library, the Civic Center, features over 300 computer terminals, room for 1100 laptops, and a new wing for children. Library visitations doubled in its first year open, from 1.1 million to 2.1 million, and the number of library cardholders nearly tripled. ITC Systems serves colleges, universities and a host of other market segments by providing products and services focused on campus ID card privilege control, access control, and copy and print control. The company also offers card-related products and services for food service, laundry and other institution-wide sectors. Founded in 1989, ITC Systems maintains a large dealer network throughout North America and internationally, and it is the industry’s dominant Original Equipment Manufacturer (OEM). To learn more about ITC Systems, please visit https://itcsystems.com.